Tribune Chronicle / Ron Selak Jr. Newton Falls native Kathleen Harley stands outside St. Elizabeth Youngstown Hospital on Belmont Avenue in Youngstown. Harley of Austintown was recently named president of the hospital. YOUNGSTOWN — Architecture’s loss is health care’s gain. It was in high school in Newton Falls that Kathleen Harley, then Kathleen Layshock, considered architectural drawing as a career, supplanting childhood thoughts of becoming a nurse. But whatever she wanted to do post-high school, she needed money after graduation to legitimately apply for school. 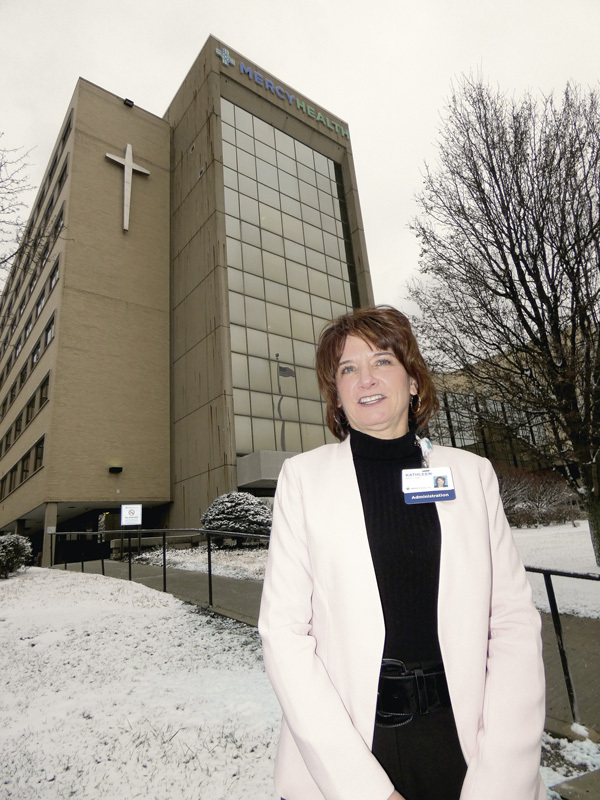 That job — as a nurse’s aid — started a trajectory of nursing and leadership positions at Trumbull Memorial Hospital and Heritage Valley Health System in Pennsylvania before returning home to become president of St. Elizabeth Youngstown Hospital. “The director of nursing was adamant, relentless with me that I needed to go back to school to be a nurse because I guess she saw something in me and she was like, ‘You really, really need to think about doing this.’ And I guess I took her words to heart and started down that path,” said Harley. Harley has been president for about three weeks. Mercy Health, which operates the hospital, announced her as president last week. Her office on the first floor of the Belmont Avenue hospital is pretty bare and she’s still learning peoples’ names, but something struck her immediately upon coming to work. The staff, she said, are some of the most “engaged, optimistic and energized people” she has worked with in a while. “For me, it is tangible, the engagement of this health care staff. They want to deliver a great service to this community,” said Harley, who lives in Austintown. Harley graduated from Newton Falls High School in 1978 and five years later enrolled at Trumbull Memorial’s school of nursing. After the three-year program, which the hospital used as a feeder for its nursing staff, Harley took a job there. She was recruited to work in critical care, which she did for a couple years before becoming an operating room nurse. The position at first, however, was part-time, so to make ends meet she did home health care for infants on ventilators as a visiting nurse. She joined the operating room full-time in 1994, eventually taking on the roles of operating room education and then nurse educator before becoming operating room nurse manager. But the trajectory into administration wasn’t something she said she planned for. “I actually wanted to be seen in a different light,” Harley said. About the same time the hospital system was opening a freestanding surgery center on Elm Road in Bazetta, Harley was a registered nurse first assistant and working long hours on her shifts and the on-call shifts for one surgeon. She married and wanted to take a step back and thought transferring to the new surgical center would afford her the ability to do so, but feared her working mostly in neuro, or heads, and vascular would prevent her being chosen to work at the center. So she bid on on the nurse manager job for the surgical unit. She was interviewed by three nursing directors. “Quite honestly, I knew I had to be seen in a different light, that I could do something different,” Harley said. She left Trumbull Memorial in 2000 to become director of surgical services at East Liverpool City Hospital, where she stayed for two years before moving on to Heritage Valley Health System, first as director of surgical services, then to vice president of patient care and ultimately chief nursing officer. And during her career, she attended and graduated from Penn State University with a bachelor’s degree in nursing and from Youngstown State University with a master’s degree in business administration. The future of health care is quality, access and experience — “three very real words not to pay lip service to,” Harley said. The challenge is providing high-quality care that is affordable and can be received by anyone who needs it while balancing rising costs. “We can do this, if we are all rowing together in the same direction for the good of all, we can do this and Mercy will do it,” said Harley.